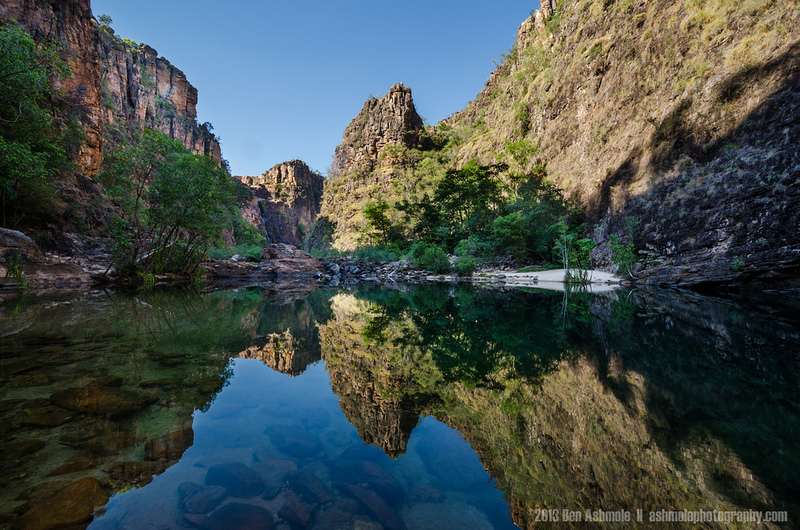 No journey to the Northern Territory can be considered complete without a trip through Kakadu National Park. Located just three hours to the east of Darwin, the park is listed with the World Heritage and is considered a true Australian cultural treasure. You could spend months exploring the many sights and attractions within the Park and still only scratch the surface of all that it has to offer. The area has been a rich resource for mining since the late 1970s - gold and uranium were both discovered within its boundaries and uranium mining continues to this day. For most visitors, however, the mining is of little interest. The real natural resources that attract most tourists are the unique flora and fauna that fill the landscape and give it life. Within the Kakadu are an amazing array of animals and plants that include some 1700 different species of plants, and a comparably impressive selection of mammals, birds, and other creatures. To date, more than 70 species of mammals have been identified, including kangaroos, tart bats, bandicoots, and wallabies. Close to 300 species of birds call the area home, including a number of vulnerable or endangered varieties and a large selection of water birds. More than 110 reptile species are within the Kakadu boundaries, including freshwater and saltwater crocodiles. The natural rock landscape is another attractive feature. There are plenty of sites where you can view aboriginal art, including rock paintings like the images of the Rainbow Serpent. In addition, there is an abundant supply of lush waterfalls and enchanting gorges that continue to attract many thousands of tourists each year. And while there is no hunting permitted within this National Park, there are plenty of opportunities for recreational fishing, particularly for those who are trying to catch the popular barramundi. With a number of commercial sites available nearby, and many different fee-based park-operated campgrounds within the Kakadu, finding accommodations is a fairly simple process. And once you have that home base established, you’ll be ready to begin the adventure of a lifetime as you experience all that the Kakadu National Park has to offer! Visitors to the National Park need a place to call home base while they’re in the area - something close enough to Kakadu to make their adventures a breeze, but also close enough to civilization to provide for those basic needs that even campers require. The Cooinda Campground and Caravan Park can be that ideal base of operations! It’s a shady area that is nestled near the Yellow Water Billabong, warmly encompassed by all of the gorgeous scenery and diverse wildlife that the region has to offer. But natural beauty is but a part of the charm of this campsite. It also provides all of the modern amenities any traveler could desire, including restaurants and a bar, a desk for tours, clean and well-maintained amenities, and swimming pools for cooling off and lounging around after a heady day of adventure elsewhere in the Kakadu National Park. There’s a guest laundry, an area for the children to cut loose and play, barbecue areas for cooking, and a camp kitchen. Powered site prices begin at $41/night per site, maximum 6 persons per site. With a restaurant and bar, barbecue and camp kitchen, and clean amenities, this park inside the Kakadu National Park is a great place to base all your adventures in the wild. There are powered and unpowered sites, a pool for park guests, and plenty of shade and grass for your enjoyment and comfort. Call the lodge for current rates and availability! There are a host of low-cost options for camping in the Park, at any of the park-operated campsites. Unlike commercial sites, however, there are no bookings available. Instead, sites are simply provided as people show up, and when a site is full, it’s full. You can, however, choose to camp outside one of these specific areas if you obtain a permit. There is also bush camping available throughout the park for as little as $5/person, per night. It’s also worthy of noting that the managed campsites within the Park - such as Mardugal in the Yellow Water region - have many of the amenities you’ll find in commercial locations, including showers and running toilets. Some of these options can be enjoyed for as little as $10/adult per night.